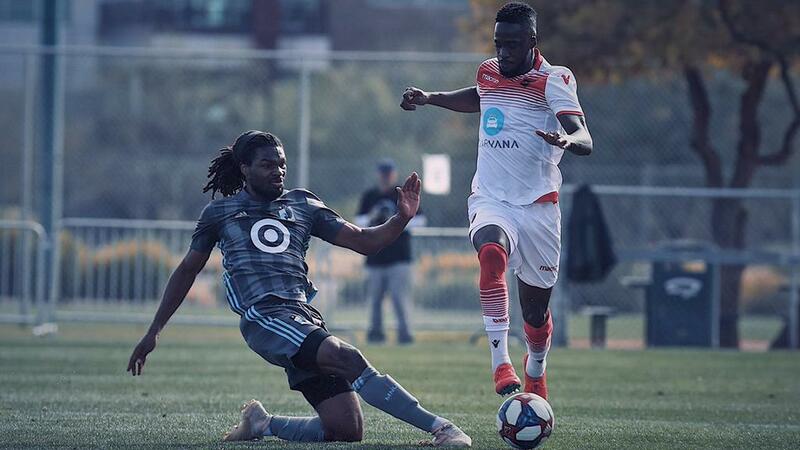 TUCSON, Ariz. – Phoenix Rising FC played to a 0-0 draw against Major League Soccer’s Minnesota United FC in its opening game of the 2019 Mobile Mini Sun Cup on Saturday afternoon at the Kino Soccer Complex. Rising FC had the better of the scoring opportunities in the first half. Forward Adam Jahn nearly scored in the 11th minute after United goalkeeper Bobby Shuttleworth spilled his save toward the goal line, but he dove to the ball and covered it up just before Jahn arrived. Jahn had another chance in the 28th minute, this time getting to the end of a Jason Johnson cross, only for the shot to go right at the Shuttleworth. Phoenix’s second-half lineup featured a mix of Rising FC and players from the club’s USL League One side FC Tucson as Koda Wakasa and Raheem Somersall helped man the side after the break. Despite keeping Minnesota off the board, Phoenix couldn’t find the back of the net in the second half with limited scoring opportunities. D.C. UNITED 1, BETHLEHEM STEEL FC 0: Shinya Kadono scored the only goal in the second half as D.C. took victory against Steel FC in Clearwater, Fla. A trialist with United this preseason, Kadono found the bottom-right corner of the net in the 57th minute to break the deadlock as Bethlehem was unable to find an answer in the final 30 minutes. TAMPA BAY ROWDIES 1, BIRMINGHAM LEGION FC 0: The Rowdies edged out USL Championship newcomers Legion FC as Brandon Allen’s goal proved the difference in a closed-door scrimmage at Al Lang Stadium between the Eastern Conference sides. OKC ENERGY FC 3, UNIVERSITY OF TULSA 0: Jamaican international Deshorn Browns scored two of Energy FC’s goals as it opened its preseason slate with a solid road victory against the Hurricane. All three goals came in the first half for the visitors, who also saw Joshua Garcia find the net. SWOPE PARK RANGERS 5, BARTON COMMUNITY COLLEGE 0: Trialist Guy Stephane Bedi scored twice as the Rangers cruised to victory against the Cougars. Ethan Vanacore-Decker opened the scoring for Swope Park midway through the first half, but the Rangers ran away with the game after the break as Bedi scored from the penalty spot early in the second half before fellow trialist Nicolas Solabarrieta made it 3-0 when he curled a brilliant strike into the top corner from the edge of the area. Bedi added his second of the day by heading home from close range following a save from the Barton goalkeeper and then trialist Christian Schneider completed the scoring in the 78th minute, latching onto Bedi’s through ball into the area and firing high into the near post. TULSA ROUGHNECKS FC 2, OKLAHOMA WESLEYAN UNIVERSITY 1: Akeil Barrett had a goal and assist as the Roughnecks took victory against the Eagles in Bartlesville, Okla., as all the goals came in the second half. Barrett opened the scoring off an assist by D.J. Dean, and then laid on a second for Janu Silva before the Eagles pulled a goal back, but the Roughnecks saw out victory as 25 players in the squad saw action. EL PASO LOCOMOTIVE FC 2, HOOLIGANS FC 0: Locomotive FC scored twice in the second half, including a late penalty kick by Sebastian Contreras, to come away with victory at the Westside Soccer Complex.